These restorations are great alternatives to conventional crowns. They are used when teeth are broken down or the filling is getting too large. 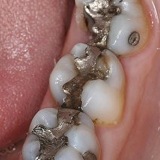 If a filling is too large it has a higher chance of failure, in the past we use to crown these teeth. However crowning a tooth can be quite destructive and a inlay is much more conservative on the tooth. Inlays can improve the appearance and strength of a tooth. The process normally involves two visits, the first to prepare the tooth and the second to fit the custom made inlay.